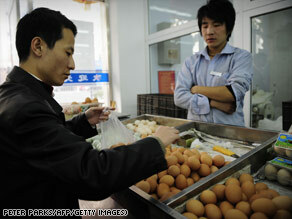 (CNN) -- The Director of Hanwei Eggs was contrite. "We solemnly apologize to consumers," said Han Wei. "We apologize to the distributors. We solemnly declare that our company has never purchased melamine. We have never adopted melamine to the feeds or products." But somehow melamine got into eggs produced at the company's plant in Dailin in northeast China. Chinese consumers were taking the news in stride. "Stop eating eggs?" asked one customer. "That's not doable." Melamine is a chemical used in making plastics and fertilizer. But in recent times, it has become the badge of shame for the Chinese food industry after being illegally added to food products to suggest they contain a higher level of protein. U.N. officials are concerned that melamine has been introduced to animal feed and may turn up in chicken, pork, farmed fish and other products. Tainted eggs from Hanwei were discovered in Hong Kong late last week; melamine was present at nearly double the maximum permissible level. Chinese consumers -- by now familiar with food safety alarms -- were taking the news in stride. "Stop eating eggs?" asked one woman. "That's not doable. If there's a problem with eggs it should be solved fundamentally. People can't live without eggs in their daily lives." A younger woman had the same view: "We can't be too serious, if we think too much about the vegetable and meat we eat, we can't eat anything." The egg scare is unlikely to take on the dimensions of the tainted milk powder scandal, which has sickened more than 50,000 Chinese children and led to the deaths of four babies. Again, melamine was the culprit -- and the consequences could be long-lasting. The World Health Organization says that crystals have been found in the kidneys of some children. WHO's regional food safety expert Anthony Hazzard told Reuters Tuesday: "We believe at this stage that it's really the complex of melamine and cyanuric acid forming what you call crystals ... they can form in the small tubules [in the kidneys] and they get bigger and can block the tubules." Experts say melamine's health risks are not well known. According to Dr. Dan Blumenthal of the Morehouse School of Medicine in Atlanta, Georgia, "Something we don't know is whether there is a safe amount of melamine in food. I'd rather not eat any melamine at all. There is a limit that is not based on animal studies, but we can't be certain that even the small amount is safe in humans, especially if consumption of the chemical goes on for years." In the meantime, Blumenthal recommends "the prudent thing to do is to stay away from foods that might be contaminated, and this especially means infant formula and other dairy products that are coming from China." The Chinese leadership, long criticized by other governments for poor food safety standards, has promised action. A committee of the National People's Congress is reviewing a new draft law. Prime Minister Wen Jiabao said last weekend, "Food is a continuous process that begins in the fields and ends on your dinner table. From production to transportation to refining to packaging to manufacture, every process needs to go through thorough and strict testing." • And a unified and efficient food safety testing and inspection system. The stakes are high for China's food industry and its consumers. Food exports from China were worth $27 billion in 2006 and Chinese food exports to the United States have risen fivefold since 1990. Recent scandals involving melamine have led governments around the world to ban the import of certain Chinese foods; and Beijing wants to restore credibility to the "Made in China" label.